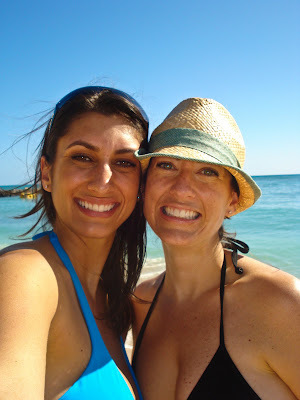 Yes, we took a four-day "Sister Trip" to Hawaii! While we were out there, my Saint of a husband had to fly back out to England (I say Saint because while I was out snorkeling in the ocean, he was taking a red eye with a raincoat). Although he was flying even further away from me, I was intrigued by the fact that when we spoke to each other, it would be our longest distance phone call to date! When I told this to Max, he reminded me that he called me via Satellite phone when he was at the South Pole. I checked the exact distances, and our South Pole to San Jose calls clocked in at a distance of 8,810 miles while our London to Honolulu calls would be a 9,790 mile difference. We had a new winner!! I'm the blue and Max is the red, and even google maps knew we were way too far apart! You're right, we ARE too far apart!